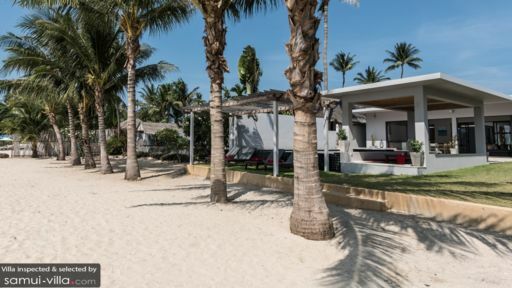 The luxurious Villa Red on the island of Koh Samui in the northern part facing the beaches with its periphery dotted with towering palm trees. The four-bedroom opulent private villa boasts of five-star facilities with excellent dining/accommodation/living and is spread across three adjacent buildings. There is an infinity pool looking out towards the island of Koh Phangnan and the famous Big Buddha. The gorgeous property is replete with ample activities and entertainment for its guests on top of comfortable living. Villa Red is marked by contemporary and traditional décor and design, and is the ideal location for a tropical getaway with family and friends. Villa Red has four spacious, air-conditioned bedroom suites. Each of the four rooms opens out to the gardens, to ensure that there is ample opportunity to enjoy the beauty of Samui and its abundant tropical foliage. The rooms are furnished with double beds and the rooms are connected in pairs through a vestibule to make for a suite, if required. The décor is minimal accentuated by the signature red colour of the villa. The opulent spaces also boast of en-suite bathrooms with soft terrazzo with showers, while two bathrooms even have terrazzo baths. The villa connects to the beach out front, and the towering palm trees outline the entire stretch of its sandy shores. There are sun loungers placed under the shade of a sala, creating a comfortable space from where you can observe the crashing waves and other activities on the beach. Just behind the chairs is the infinity swimming pool, a luxurious affair with a chic design. 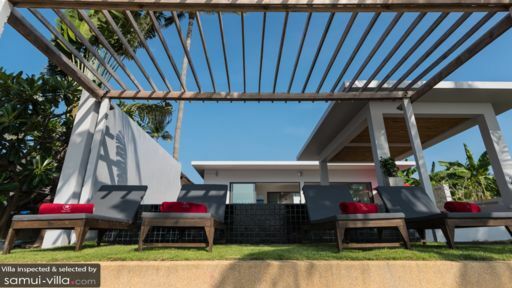 Beside the pool, you will find a sunken sitting area with cushioned seats, where you can enjoy drinks or even your meals while relishing the quiet and calm of the island of Samui. Guests can reach the main living pavilion through glass sliding doors, and is an open plan design because Villa Red prides itself in harbouring a harmonious indoor and outdoor setup, so that guests can make the most of their stay both inside with luxurious comfort and outside with the magnificence of the island right at your doorstep. The living area is exceptionally well-furnished and offers quality entertainment services to the guests with a 50 inch-flat-screen TV and Bluetooth surround sound where you can enjoy watching films while relaxing on the comfy couches for a full movie experience! The living area is luxurious and chic with elegant décor including traditional artwork on the walls. The cosy and personal space will make you feel right at home and it also offers a living and dining experience like no other. There is a large dining table in the middle, also overlooking the pool and the beach, which is meant for 10 people. The western kitchen is fully-equipped with modern appliances and amenities, for your comforts! For the duration of your stay at Villa Red, you will be looked after with care by the kind staff in residence. They can arrange for several things for your comforts including transportation and in-house massages. A complementary, lavish breakfast is served each morning to start off the day with a bang! The villa is child-friendly and thus offers babysitting services and other services for those traveling with children. 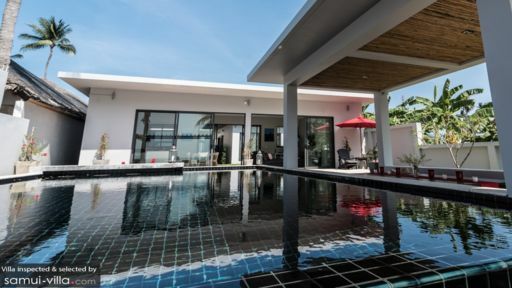 There is much to see and experience in Koh Samui, and since the villa is in a convenient location, guests have a chance to discover more of the island. The temple of the Big Buddha is a must-visit site as it tells you about Thai culture, history and heritage. The Ang Thong Marine National Park is another great way to spend your day. You can even opt for Thai cooking lessons, if you wish to learn about the local cuisine! Chaweng beach in the Bophut area is another popular spot, where you can find excellent restaurants and bars for dining out or to even grab a few drinks.